A woman places flowers near the mosque where a shooting left six people dead, on Jan. 30, 2017 in Quebec City. Amir Belkacemi stood in a Quebec City courtroom on Wednesday and called Alexandre Bissonnette a ”monster,” urging a judge not to ever let his father’s murderer walk the streets again. 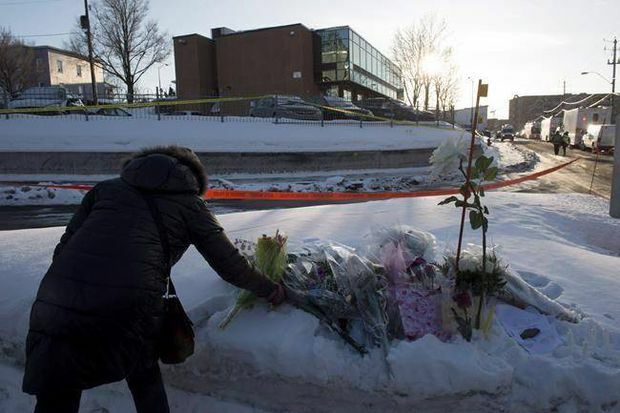 Mr. Bissonnette, who pleaded guilty to six counts of first-degree murder in the Quebec City mosque attack last year, faces the possibility of a sentence unprecedented in Canadian history: 150 years before he is eligible for parole. That possibility, and other multiple-murder cases in the past five years that would leave convicted killers in prison for their entire lives, has touched off a debate about the law that allows for it. Under the federal Criminal Code, the penalty for first-degree murder is automatic: life in prison, with first chance at full parole after 25 years. But, in 2011, the Conservative government gave judges the authority to add the 25-year parole waiting periods together in cases of multiple murders. Since then, four men have been sentenced to 75 years of parole ineligibility, out of the 18 who have received parole ineligibility periods stacked together. One of them, Douglas Garland, would have to live till 132 to be eligible for parole. The first use of the law was in 2013, when armoured-car driver Travis Baumgartner received 40 years ineligibility for one first-degree murder and two second-degree murders. (In second-degree murder, parole eligibility ranges from 10 to 25 years). To the families of Mr. Bissonnette’s victims, jail for life is only just. “The man behind me is a monster,” Mr. Belkacemi said of the convicted killer, seated in handcuffs in a glass enclosure. “I think that monsters have no place among those of us who have chosen to cherish our humanity.” Mr. Belkacemi, who lost his father in the attack, was the latest in a succession of victims who spoke in court this week to seek extended prison time for Mr. Bissonnette. Others say that a sentence beyond the natural lifespan is cruel and unnecessary. The stacking of parole ineligibility periods has given Canada an equivalent to the life-without-parole sentence widely used in the United States. The difference is that in Canada, its use is limited to multiple murders. In the United States, there are more than 50,000 people serving a sentence of life without parole. It is not mandatory for judges to stack parole periods together. Judges “may, having regard to the character of the offender, the nature of the offence and the circumstances surrounding its commission … decide that the periods without eligibility for parole for each murder conviction are to be served consecutively,” Section 745.51 of the federal Criminal Code says. Judges have interpreted this section to mean they could sentence someone to, say, two consecutive periods of 25-year ineligibility for six first-degree murders, if they choose. Or they could choose just one 25-year period, or six. Thus far, judges have upheld its constitutionality when it was challenged as a form of cruel and unusual punishment. ”There is nothing grossly disproportionate about the imposition of an effective sentence of life imprisonment, without parole, for an adult offender who has murdered at least two different victims,” Ontario Superior Court Justice Ken Campbell wrote last year in the case of Mauro Granados-Arana, convicted of one count of first-degree and one of second-degree, and given parole ineligibility of 41 years. Mr. Bissonnette’s lawyers say that at a sentencing hearing in June, they will challenge the constitutionality of the parole ineligibility law for multiple murders. Mr. Bissonnette’s sentencing hearing continues.